This is good news for both MRT Corp and Klang Valley residents. To date, about 2,630 residents, or 94% of respondents who will be affected by the alignment of the MRT Sungai Buloh-Serdang-Putrajaya (SSP) Line 2, are happy with the project, The Sun reports. “We conducted the survey from May 15 and received lots of positive feedback from the residents,” SSP Line deputy project director Maslan Othman told reporters at the simulation session of the proposed 52.2 km second MRT line. The MRT Corp rep explained that it was part of Land Public Transport Commission (SPAD) requirements to conduct public displays to gather response from stakeholders and the public for three months (ends August 18), before starting with the evaluation, approval of final alignment and planning, design and tender process. “We will maintain regular communications with stakeholders and the public to ensure a systematic, efficient and prompt response to any complaints and feedback,” he said, adding that contact channels include the MRT hotline (1-800-82-6868), MRT website, MRT information centre, truck and kiosk. The MRT Line 2, which will have 36 new stations (excluding three that it will share with the Sungai Buloh-Kajang SBK Line 1), is expected to serve a catchment population of around two million, with an estimated daily average passenger count of 529,000 when operations commence in 2022. Construction is expected to start in June next year. The new line is slated to begin from Stesen Kwasa Damansara and end at Putrajaya Sentral. There will be interchange stations with the MRT SBK Line 1, KTM Komuter, LRT and KLIA Express/Transit lines. Sure they approve lah, their house price will increase. Overall it is good. What’s the point of having a putrajaya station when it is not connected to the federal government administration centre, where all the government offices and servants are? It is also a tourist spot. There is already a putrajaya station via ERL but stops at putrajaya hospital. You can always take the bus from Putrajaya Sentral to any other destinations in Putrajaya. this can give another opportunity for another project for integration. That’s may be monorail @ Putrajaya.. another billion project. Why would anyone not approve this project? I can go to work using MRT1 when its (hopefully) complete in 2017. Sometimes these polls are very questionable. 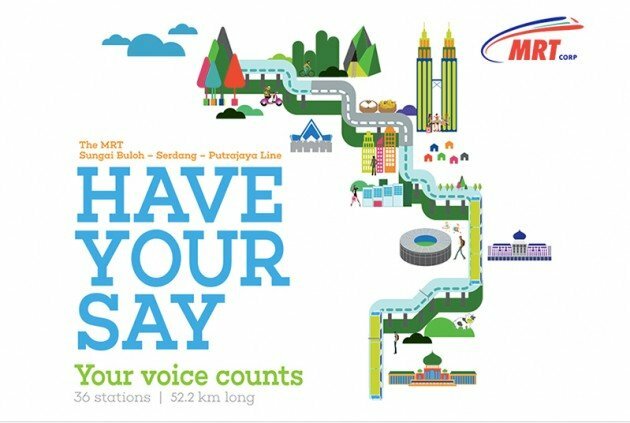 Recently,MRT Corp has done an online poll on some matter – guess what? There is no need to leave any names or id. Just click Yes or No. And there is no stopping someone from clicking Yes a hundred times a day if he wanted to. Therefore, the polls can be set up to have results which are intentionally skewed to a certain desired outcome. Wow so a govt entity tells us the people like it? I dont buy it this govt has no credibility whatsoever.